Mediumship is the most fundamental aspect of Spiritualism. It is the very foundation, for without it there would be no proof of human survival, and thus, there would not be the movement of Spiritualism. Mediumship simply put is the communication between a mortal person known as a 'medium' or 'channel', and a discarnate person living in the spirt world. This is accomplished by the means of mental telepathy in the case of mental mediumship, which is the most prevalent. Mediums are born with a natural psychic gift or a sixth sense. During childhood between the ages of five and eight the child seems to be the most psychic. Often, they will tell their mother that they have a little play friend or that they were talking to Grannie. The mother's response usually is, "Johnny if you do stop that nonsense I am going to spank the hell out of you." So in light of this, the child keeps future manifestations to himself or they may stop all together. As an adult if exposed to Spiritualism the gifted person may realize that although unusual there is nothing wrong with being born with psychic ability, and may begin to develop the gift by years of training in what is known as 'sitting in circle'. This training can last six years or more before the person becomes a qualified medium and is sufficiently skilled to take the platform and demonstrate his or her mediumship in public. This demonstration known as 'proof of survival', is the backbone of Spiritualism, and is how a majority of people are attracted to Spiritualism and convert to its philosophy. The demonstration's purpose is to provide information of a deceased loved one to prove that person is still alive and well living in another dimension. The information can take many forms such as: the persons cause of death, a description of the deceased person, important dates and events that only the two had shared. Oftentimes there is advise given to help the mortal person with a problem or a decision that is soon to be made. This demonstration can take place at a spiritualist church, a meeting hall, a high street theatre or even the Royal Albert Hall. Regardless where, the procedure is always the same, the medium takes the platform, links with a spirit loved one and gives the recognizable evidence. In order for this to be accomplished the spirit loved one must leave his or her home in the spirit world, come down to the earth-plane where the meeting is taking place, get into the queue behind the medium, wait until it is their turn and then send their thoughts telepathically to the medium to be conveyed to their loved one in the audience. Once the medium has made the link with the spirit loved one they are able to find the person in the audience who belongs to the communicating spirit. Then, the medium will say, something like, "May I come to the lady in the white blouse? ", and then gives information that is meaningful only to her. Generally, the spirit loved ones are ordinary people, many of whom did not have a clue that they were going to survive physical death. So their messages are of an ordinary nature like, please get the leak in the roof taken care of before the rain comes, or can you have the clasp on the locked mended that I gave you so you can wear it. However, on occasion a medium displays the ability to link with higher more knowledgeable spirits, when this occurs spiritual knowledge is imparted and publish and made generally available. Most of the various forms of psychic phenomena associated with mediumship are as old as man himself. Throughout the ages humans have been aware of the existence of discarnate spirits. In early days, when man lived close to nature, ancestor-worship became a form of religion; primitive man had no doubt that his ancestors had survived death and that they had powers to affect the living for good or ill. Therefore, due reverence was shown to them in order to incur favor. The wise men of the tribe, who were possessed of psychic powers, the equivalent of modern mediums, would testify to the presence of the spirits and forms of contact were established with them. Attempts to communicate with the departed have been documented in early human history. Cave paintings by indigenous Australians date back 28,000 years, some depicting spirits and the afterlife. The story of the Witch of Endor, tells of the woman who raised the spirit of the deceased prophet Samuel to allow the Hebrew King Saul to question his former mentor about an upcoming battle, as related in the first book of Samuel in the Jewish Tanakh - The Old Testament. The Greeks consulted oracles and the Assyrians and Romans practised divination by augury to obtain guidance from the gods. Even today some cultures have their witch-doctors, who invoke the powers of spirits for healing. It can be seen, therefore, that there is nothing new in the concept of a spirit world inhabited by discarnate beings or in the use of psychic power to achieve spirit communication. The early Christian Church was founded on the basis of mediumship, Jesus of Nazareth being considered to have been an exceptionally gifted medium, as illustrated in the reports of his healing powers, inspired teachings and so-called 'miracles'. After the Crucifixion it is recorded that Jesus was seen and heard by Paul and others, and it is clear that mediumship played an important role in the work of the Apostles spreading the new religion and its presentation in church services. The Bible in both the Old and New Testaments has many references to psychic abilities, inspirational speech, speaking in other languages, physical mediumship and healing. However, the 4th century the Council of Nicaea brought an end to the use of mediums and held that divine guidance through the Holy Spirit should be sought only from the priesthood. False prophets were held to be servants of the devil, and sorcerers, heretics and mediums were all targets for persecution as a result of 'witch-mania'. This accelerated in the Middle Ages, when religious sanction for this persecution was given in 1484 by a papal bull and by the publication of the Malleus Maleficarum or Hammer of the Witches. During this long period of persecution anyone suspected of using psychic abilities for whatever purpose was in danger of torture, trial and burning. Hundreds of thousands were put to death by witch-hunters. Mediumship gained popularity during the nineteenth century in the United States and in Britain after the rise of Spiritualism as a religious movement. The ouija board was used by the upper classes as a source of entertainment. Mediumship reach it's zenith during the Victorian Age, when the trance mediums Paschal Beverly Randolph and Emma Hardinge Britten were among the most celebrated demonstrators, lecturers and authors on the subject. Some scientists of the period who investigated Spiritualism also became converts. They included chemist Robert Hare (1781-1858), physicist William Crookes (1832–1919) and evolutionary biologist Alfred Russel Wallace (1823–1913). Nobel laureate Pierre Curie (1859-1906) took a very serious scientific interest in the work of medium Eusapia Palladino. Other prominent adherents included journalist and pacifist William T. Stead (1849–1912) who perished on the Titanic, and physician and author Sir Arthur Conan Doyle (1859–1930). After the exposure of the fraudulent use of stage magic tricks by physical mediums such as the Davenport Brothers and the Bangs Sisters, mediumship fell into disrepute. However, the religion and its beliefs continued in spite of this with physical mediumship and seances falling out of practice and mental mediumship coming to the forefront. In Spiritualism the medium has the role as intermediary between the mortal world and the spirit world. Mediums can hear, see and sense spirits to relay messages, or a medium can be used by a spirit to control their body as in direct voice or by using automatic writing or drawing. Mediumship is classified into two main categories 'mental' and 'physical'. Mental Mediumship - Mediums who are purportedly able to 'tune in' to the spirit world by listening, sensing, or seeing spirits or symbols. Mental mediumship is communication of spirits with a medium by telepathy, and is also known as 'telepathic mediumship'. The medium mentally sees by clairvoyance, hears by clairaudience, and feels by clairsentience spirits either directly or with the help of a spirit guide. The medium then conveys the information on to the sitter. Cold Reading - A set of techniques used by mentalists, psychics, fortune-tellers and illusionists to imply that the reader knows more about the person than he or she actually does. Without prior knowledge, a practiced cold-reader, can quickly obtain a great deal of information by analyzing the person's body language, age, clothing or fashion, hairstyle, gender, race or ethnicity, level of education, manner of speech, place of origin, etc. Cold readings commonly employ high-probability guesses, quickly picking up on signals as to whether the guesses are in the right direction or not, then emphasizing and reinforcing chance connections and quickly moving on from missed guesses. Hot Reading - A technique used when giving a psychic reading in stage magic performances, or in other contexts. In hot reading, the reader uses information about the person receiving the reading from background research or overhearing a conversation, which the receiver is not aware that the reader already knows. Hot reading can explain how a psychic reader can get a specific 'hit' of accurate information. This technique is used by some television psychics in conjunction with cold reading. The psychics may have participants schedule their appearance ahead of time, and then collect information using collaborators who pose as evangelists, brush or magazine sales people and similar stratagem. Such visitors can gain considerable information from examining a person's home. The psychic will then be briefed on the information and told where the person will be sitting in the audience. Trance Mediumship - During seances mediums go into a trance state, which can vary from light to deep that permits the spirits to control the medium's mind and actions. Most trance mediums remain conscious during the communication period, but some go into a sleep-state that permits a spirit to use the medium to communicate. The spirit influences the medium's mind with the thoughts being conveyed, and the medium allows the ego to step aside for the message to be delivered. At the same time, the medium can have awareness of the thoughts coming through and may even influence the message with his or her own bias. Trance phenomenon is the result of intense focusing of attention, which is the key psychological mechanism of trance induction. In the typical deep trance, the medium may not have clear recall of all the information conveyed while in this altered state such mediums generally work with an assistant. That person selectively writes down or otherwise records the medium's words, rarely does the assistant record the responding words of the sitter and other attendants. In the 1860s and 1870s trance mediums were very popular. Spiritualism generally attracted female adherents many who had strong interests in social justice. Many trance mediums delivered passionate speeches on abolitionism, temperance and women's suffrage. Scholars have described Leonora Piper as one of the most talented of the trance mediums in the history of Spiritualism. Inspirational Speaking - This is when a medium channels an address from a spirit though not in a trance state. It is said that the words uttered generally pop into the speakers head just before they are spoken, which is considered to be a form of clairaudience. Automatic Writing - Also known as 'independent writing', 'direct writing' or 'spirit writing', and is a process or product that does not come from the conscious thoughts of the writer. The writing is performed without apparent intent or conscious control to achieve spontaneity or uncensored expression. It can be done in a trance state, but most often the writer is not in trance and is aware of their surroundings but not of the action of their writing hand. With automatic writing the medium will sit holding a pen or pencil and the spirit communicator will influence the medium's mind and control his or her hand sometimes at great speed to convey their communication onto the paper. The medium may be unaware of the content of the communication until he or she reads it afterwards. 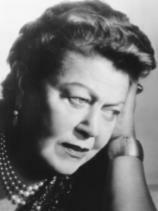 Geraldine Cummins is an example of a famous automatic writing medium. In my estimation of all the spirit communications that I have read the automatic writings of James Padgett originate from inhabitants of the spirit world that occupy higher levels. The following is an excerpt from his wife Helen explaining the method she uses to write to her husband. "When you take hold of the pencil, I exercise all my power to move the pencil so that it will write just what I think and in order to do that my thoughts go through your brain. You do not do the thinking but merely allow my thoughts, and the movement of the pencil is caused by the exercise of your brain in conjunction with the power that I exercise on the pencil. So, you see, you do not originate the thought, but merely convey it to the your hand, which I guide in accordance with my thought. You do not have anything more to do with what is written than an electric wire has to do with transmitting a message from the party at the end where the message is sent." Trance Channelling - This is the modern commercial form of mediumship, where the channeller purportedly receives messages from teaching-spirits, an alleged ascended master, from an angelic entity or supposedly from God. The information is thought to essentially come through the filter of the medium's own waking consciousness or what is called the 'higher self'. When in trance the medium appears to come under the control of a spirit. Some channellers open their eyes and remain able to walk and behave normally while rhythm and intonation of the voice may completely change. A widely known channeller of this variety is J. Z. Knight, who claims to channel the spirit Ramtha. Other notable channellers are: Jane Roberts for Seth, Esther Hicks for Abraham, and Carla L. Rueckert for Ra. Physical Mediumship - Defined as the manipulation of energy by spirits. This type of mediumship is claimed to involve perceptible manifestations such as: loud raps, bell-ringing, voices, materialized objects, apports (objects appearing), entire materialized spirit bodies or just hands, legs and feet. The medium is used as a source of power for such spirit manifestations, which is believed to be accomplished by using a substance called 'ectoplasm'. This material is said to be created from the cells of the medium's physical body and those of seance sitters. Most physical mediumship is presented in a darkened or dimly lit room, and a traditional array of tools and appurtenances (apparatus) are used including: trumpets, cabinets and levitation tables. Physical Ectoplasmic Mediumship - A person whose level of ectoplasm allows for the physical manifestation of non-physical entities and non-physical objects. Ectoplasm is a supernatural viscous substance that is supposed to exude from the body of a medium during a trance-state that forms the material for the manifestation of spirits. It is unstable and looks like: tenuous vapors, spirals, threads, cords, webs or rays. Usually, ectoplasm would ooze from the medium's body, mouth, ear, nose or any other orifice. The ectoplasm would sometimes look like gauze, cloth-like material and would mysteriously take the form of a face of a spirit that was invited, or can appear as an entire semi-physical person. During this process the people present can see the materialization and dematerialization, so this phenomena can be witnessed during séances. Direct Voice - Direct voice communication is when a spirit speak independently of the medium who facilitates the phenomenon rather than produces it. The role of the medium is to make the connection between the physical and spiritual worlds. Trumpets are often utilised to amplify the sound, and direct voice mediums are sometimes known as 'trumpet mediums'. This form of mediumship also permits the medium to participate in the discourse during séances, since the medium's voice is not required by the spirit to communicate. Direct voice as it implies comes directly from the spirit world and not from the medium's vocal cords, but is produced by the creation of an ectoplasmic voice box. Remote Viewing - The phenomenon of remote-viewing can also be technically called 'travelling clairvoyance'. Therefore the remote-viewer can clearly see people, places, things and events happening at long distances in the physical dimension or in the non-physical dimension. The remote viewer can also describe with their eyes-open what is being seen and happening in real-time. Precognition - A person who has the ability to get information from a spirit who knows what the immediate future may hold. The future may not unfold according to the prediction because people have freewill and with it the capacity of choice to change their future. Mental Telepathy - A person that can read the information being transmitted from one person to another in the physical or non-physical dimensions. In the physical dimension, telepathy occurs when the alpha rhythms of the two communicating minds enter into synchronicity. Psychometry - A person that can read information contained in the energy of objects. The psychometrist can acquire information from the present or the past and details of the owner from an object. If the owner is deceased, the time that he or she lived can be ascertained by reading the energy that is attached to the object. One of the most positive applications of psychometry is the finding of missing persons. Psychic Art - Psychic art is different from ordinary art because a spirit uses the medium's hand to draw the picture. Psychic art can be expressed by the drawing or painting of the likeness of a loved one in the spirit world or frequently a spirit guide is drawn. Messages can be portrayed through psychic art along with that drawings that offer evidence of survival. Psychic art works on a similar principal as automatic writing. Precipitating Mediumship - This appears to be an American phenomenon, and is claimed to be a form of psychic art whereby a spirit produces the drawing, not the mortal medium. It is said that the process entails the spirit or spirits to dematerialize the paint, ink, chalk, crayon, lead etc., and then rematerialize it either onto a canvas, paper or a 3x5 index card to create usually a portrait. No brush strokes can be detected because the colour is laid down by the spirit artist, which is evidence that the picture was made by supernatural means. Psychokinesis or Telekinesis - The ability to move or alter objects without them being touched. Uri Geller became famous for demonstrating on television what he claimed to be psychokinesis, dowsing, and telepathy. His performances included: bending spoons, describing hidden drawings and making watches stop or run faster. He is said to perform these feats through his will power and the strength of his mind. Medical Intuitiveness - A medical intuitive uses psychic vision to see into a person's body or by reading a person's energy or aura field to diagnose their physical health. People may see a medical intuitive when they are unable to obtain a diagnosis from traditional methods. The interesting thing about medical intuitives is that they can often diagnose the root cause of the ailment. Slate Writing - This technique was used by mediums that involved school slates and claim that spirits were writing messages on them. Usually, a pair of slates are used and shown to the viewer as clean then hidden, and then shown to the viewer again with a written message. Henry Slade (1840-1905) is credited with inventing slate writing, and incorporating it into his act as a psychic medium. Slade called himself a spiritual doctor and is often referred to as Dr. Henry Slade. Cross Correspondence - Used predominantly between 1901 and 1932 this form of mediumship was a way to test and validate the powers of mediums who were being studied by psychical researchers. Although, no longer studied cross correspondences oﬀered worthwhile proof of paranormal powers. The correspondences were made up of information that was purportedly delivered to mediums by discarnate entities while the mediums were either in a trance state or through automatic writing. The mediums were in diﬀerent locations, and in some cases diﬀerent continents. There were three types of cross correspondences: simple, complex and ideal. In simple correspondences, two or more mediums produced the same word or words, phrases or similar phrases that were connected or related. In complex cross correspondences, messages are indirect and must be deciphered. Ideal correspondences involved messages that were incomplete and had to be put together like a puzzle. Some psychical researchers believed cross correspondences provided strong evidence in support of survival after death. Omens - Chinese history offers scrupulously documented occurrences of strange births, the tracking of natural phenomena and other data. Chinese governmental planning relied on this method of forecasting for long-range strategies. It is not unreasonable to assume that modern scientific inquiry began with this kind of divination, and Joseph Needham's work considered this very idea. Sortilege (cleromancy) - This consists of the casting of lots whether with: sticks, stones, bones, beans, coins, or some other item. Modern playing cards and board games developed from this type of divination. Augury - This ranks a set of given possibilities, which can be qualitative shapes or proximities. Dowsing was developed from this type of divination, especially in the discovery of ores, springs of water, etc., by the means of a rod or wand. Augury is also considered to refer to divination by the study of the flight patterns of birds. Spontaneous - An unconstrained form of divination free from any particular medium, and actually a generalization of all types of divination. The answer comes from whatever object the diviner happens to see or hear. Some religions use a form of bibliomancy, asking a question then riffling through the pages of their holy book taking the first passage their eyes light upon as the answer. Other forms of spontaneous divination include reading auras and methods of feng shui. Palmistry - In addition to these four main categories there is palmistry also called 'chiromancy'. A practice common to many different places on the Eurasian landmass including the cultures of: India, Tibet, China, Persia, Sumeria, Ancient Israel and Babylonia. In this practice, the diviner examines the hands of a person for whom they are divining for indications of their future. In mental mediumship there are certain psychic senses that are used by mediums to acquire information that when interpreted properly from years of training are turned into messages that are meaningful to the sitter. The following is a list of these abilities. Clairvoyance (clear seeing) - This is the ability to see anything that is not physically present such as: objects, animals, people or symbols. Some mediums say that this is their normal vision state, while others say that they must train their minds through meditation in order to achieve this ability, and that assistance from spirits is often necessary. Some clairvoyant mediums can see the spirit's etheric body of energy, and thus give a description of a departed loved one. Certain mediums see the spirit in their mind's eye or it appears as a movie or a television programme or a still picture like a photograph in their mind. Often a young person who gets the description of a relative that they never knew will be told by the medium to check with someone older or take a look at old photographs. Clairaudience (clear hearing) - This is defined as the ability to hear the voices or the thoughts of spirits. The medium may hear the sounds either within their mind or as if with their physical ear. When sounds such as music and other noises occur there can be the issue of interpretation in a similar way to clairvoyance. Clairsentience (clear feeling) - This is the ability of a medium to sense the ailments of a spirit. This most often will be the cause of death, which makes for convincing evidence that the medium has linked with the spirit loved one. Clairalience (clear smelling) - This is the ability to smell an odor related to the spirit person when they were on Earth. It could be any number of things most common are: tobacco, a favorite perfume or flowers in the person's garden. Clairgustance (clear tasting) - Though not that common this is the ability of a medium to receive taste impressions from a spirit. Claircognizance (clear knowing) - This is the ability to know something without receiving it through normal or psychic senses, it is just a sense of knowing. Often, a medium will claim to have a feeling that a message or situation is right or wrong. All things in the spirit world as well as on Earth are controlled by immutable laws, and all spirits as well as mortals are subject to those laws. The law of rapport and communication that governs contact between spirits and by mortals must be complied with. Spirits have a knowledge of the condition of the mortal medium and can discern what qualities within their condition are susceptible to their influence and molding, and as a result the law may be brought into operation. Mediumship depends upon the condition of both spirits and mortals working in unison, though more depends upon the condition of the mortal. If the medium is in the proper state of development a rapport can be made. The law states, that things of the material may be conveyed through a brain that is material in its thoughts, things moral through a brain that has been influenced by moral values, and things spiritual through a brain that has assimilated the knowledge and truth that develops the spiritual aspects of the soul. The mind and the brain are not one and equivalent things, the mind is the operator and the brain is used to operate. As demonstrated by many mediums, the mind of spirits have controlled their brain and transmitted expressions of various languages and mathematics that they have had no acquaintance. The law also states, that the soul condition of the medium does not have to be comparable to that of the communicating spirit, but must at least approach it for contact to be made. Hence, one can understand why so few messages containing the higher spiritual truths or even moral truths come through mediums. The average medium can receive messages dealing with the material affairs of life, which largely are the type desired by mortals who are seeking contact with loved ones. On occasion a medium in a higher moral or spiritual condition fulfills the law, links with a higher more knowledgeable spirit, and a movement can be birthed. When this occurs often book are published as with: Emanuel Swedenborg, Andrew Jackson Davis, William Stanton Moses, Maurice Barbanell, Edgar Cayce and James Padgett. In spiritual literature there is a great diversity of opinions upon the same subject, and sometimes contradictory statements can cause doubt as to what are the facts. This is due largely to the condition of the medium as well as the knowledge of the communicating spirit. The knowledge of spirits is limited by the extent of their progress and development within the spirit world. Many spirits believe that what they have learned is the truth, and give authoritative expression to their knowledge often believing that what they know is all that may be known of the subject. These are mostly honest beliefs, but it is wise for mortals to realize that everything written or spoken by spirits is not to be accepted as the finality of truth. The churches teach that all things psychic are the work of the 'Devil', and to a certain extent this is true, however, there is no such thing as a fallen angel being the personification of 'Evil'. Never was there any 'Lucifer', or any angels thrown from the battlements of heaven into hell, and there is no 'Satan' considered as a real person. Yet, there are people who become evil spirits that one could say are fallen mortals. When a person makes their transition to the spirit world a sinner does not automatically become a saint. Decent people become good spirits, bad people become wicked spirits. Since an evil spirit can do no harm in the spirit world they look for a place where they can, and that place is the Earth. Certain mortals by their make-up and lifestyle are susceptible to the influence and destructive intent of evil spirits. Good people cannot be harmed because they are protected by loved ones who are around them at times or can come at a moments notice if under attack. The brightness of the spirit loved ones is enough to send the dark spirit packing. These spirits are thought of as spirit guides or guardian angels who help and protect. Anderson is considered to be America's greatest living medium. For more than forty years, he has been able to bridge the world of the hereafter through his ability to communicate messages of hope from deceased loved ones. Since the age of six after suffering a near-fatal illness George has had a psychic ability and has created a special relationship with spirits who use his ability to bring peace and comfort to grieving families. In his career George has done more than 35,000 sessions for the bereaved, and is the most scientifically tested medium of this century. He has earned the respect and acclaim of those who work in science, medicine and religion; not just due to his psychic ability, but his dedication to those who suffer loss. George has dedicated his life to helping the bereaved cope by delivering messages of hope with an accuracy and specificity that is unrivaled. His ability is so unusual that those in virtually every walk of life consider him a genuine conduit to the world hereafter. George is the author of the New York Times bestseller, Lessons from the Light, Walking in the Garden of Souls and We Don't Die. His books have sold more than a million copies, and have been in continuous print for more than twenty five years. Born to Jewish parents in a poor area of London's East End. His mother was devoutly religious, but his father a barber was an atheist. Barbanell was invited to attend a seance where the medium Mrs Blaustein was entranced by various spirits of different nationalities. He was not impressed, and on a second visit fell asleep. Barbanell apologized, believing that either boredom or tiredness had been responsible, but the other circle members informed him that he had not been asleep, but had been in a trance and that a Red Indian named, 'Silver Birch' had spoken through him. Barbanell was the founder and editor of the weekly spiritualist newspaper Psychic News, and for half a century devoted his life to spreading spiritual knowledge through its columns and published books, The Teachings of Silver Birch are perhaps the most popular books on the subject within British Spiritualism. 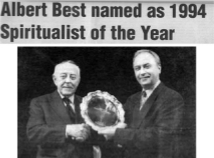 Albert began to attend the Belfast Spiritualist Alliance Church, and it was not long before it was recognized that Albert had a mediumistic gift. Though, it needed to be developed, and soon after he was invited to sit in circle. Albert then fought in the Second World War during and was taken prisoner. After being released from the prison camp, he returned to Belfast to hear that his wife Rose and three children had been killed in a German air raid on Belfast in 1941. He began to sit again in development circle, and soon had the uncanny ability to not only give names, but addresses and telephone numbers of people in attendance. In the early 1950s, Albert became acquainted with the editor of Psychic News, Maurice Barbanell. This was a strong friendship that encouraged Albert to carry on his work in a variety of places throughout the world. On a visit to India in 1991, he had an audience with Rajiv Gandhi (Prime Minister of India). Albert told him to stay out of crowds as he was in great peril. A few weeks later, Rajiv Gandhi was assassinated by a suicide bomber who emerged from a crowd. He also assisted locating victims of the 'Moors Murders', and is revered as one of the most important spiritualist mediums of the 20th century. 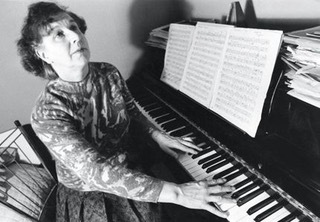 A pianist and medium born in London, who claimed that deceased composers dictated new musical works to her. She created a small media sensation in the 1970s by presenting works purportedly dictated to her by Claude Debussy, Edvard Grieg, Franz Liszt, Franz Schubert, Frédéric Chopin, Igor Stravinsky, Johann Sebastian Bach, Johannes Brahms, Ludwig van Beethoven, Robert Schumann and Sergei Rachmaninoff. Rosemary was just seven years old when she was first introduced to the world of deceased musicians. She reported that a spirit with long white hair and a flowing black cassock appeared and told her he was a composer and would make her a famous musician one day. She did not know who he was until, about ten years later, she saw a picture of Franz Liszt. Many other members of Brown's family were allegedly psychic, including her parents and grandparents. In 1948 she acquired a second-hand upright piano. Brown maintained she never had any formal musical training aside from lessons for three years in her early days. In 1964 she began transcribing original compositions she said were dictated to her by great musicians of the past. These included a forty-page sonata attributed to Schubert, a Fantaisie-Impromptu in three movements attributed to Chopin, twelve songs attributed to Schubert, and two sonatas and two symphonies attributed to Beethoven. She claimed that each composer had his own way of dictating to her. Liszt controlled her hands for a few bars at a time, and then she wrote down the notes. Chopin told her the notes and pushed her hands on to the right keys. Schubert tried to sing his compositions. Beethoven and Bach simply dictated the notes, and she claimed that the composers spoke to her in English. Besides receiving music Rosemary has hear from many ordinary people as well as from the famous. She claims to have been contacted by Albert Einstein, Carl Young and Bertrand Russel. In addition she was also a proficient psychic artist producing paintings from JMW Turner, William Blake, Samuel Palmer and the great Dutch artist Vincent van Gogh. An American medium during the early twentieth century, known as the 'sleeping prophet', and was the 'father of holistic medicine'. Cayce was born on a farm in Hopkinsville, Kentucky in 1877, and his psychic abilities began to appear in early childhood. As an adult Cayce would link with spirit physicians from whom his medical readings originated. His talents ranged from holistic health, treatment of illness, dream interpretation, and a number of philosophical readings where he discussed Atlantis, reincarnation, and made predictions of the future. One of the finest mediums of the last century and an excellent speaker. He was known as 'Mr Mediumship', since his gifts of mediumship were wide ranging and he was a man of great charisma. Gordon said, "spiritual giants have always moved among the nations of the world," and Gordon himself can rightly be called a 'Spiritual Giant', owing to his accomplishments, his influence and his dedicated work. Gordon had a detailed understanding of mediumship and Spiritualism and was a fine teacher much in demand across the country. He taught at the very first summer school at the Arthur Findlay College in 1965, and continued to teach there as Principal from 1979 to 1993. Stansted Hall was dear to him and a place where many came from far and wide to hear his lectures and see his demonstrations. Gordon suffered a stroke in 1990 following the SNU Centenary celebrations at Wembley. He made his transition at his home on 18th January 1993, after returning from serving at the Blackpool Spiritualist Church one of his favorite. Eileen J. Garrett was born in Beauparc, County Meath, Ireland. She is perhaps the most respected mental medium of the twentieth century. As a psychic researcher, she recognized the need for a scientific and an open-minded investigation of paranormal phenomena. Her contributions to the understanding of mediumship and allied phenomena remain immeasurable. She meet J. Hewat McKenzie, founder of the British College of Psychic Science, and under his guidance her mediumship blossomed. Her greatest achievement was the founding of the Parapsychology Foundation, in 1951. She was a prolific writer and the author of: Adventures in the Supernormal; Telepathy; Awareness; The Sensea nd Nonsense of Prophecy; Life is the Healer; and Many Voices. Eileen's most memorable spirit communications had to do with the case of the crash of the Airship R101, which had gone down in flames on a hillside in France, killing 48 of its 54 passengers. In a sitting with Harry Price on October 7, 1930 at the National Laboratory of Psychical Research in London, two days after the explosion of the R101, Flight Lieutenant H. C. Irwin, Captain of the airship suddenly entranced Mrs. Garrett, announced his presence and gave the listeners a highly technical account of how the airship crashed. The narrative was taken down in shorthand and a copy was submitted to the Air Ministry. According to the opinion of experts, a number of observations in the message tallied in every detail with what wasa fterwards found in the course of the official inquiry. The Greater World Christian Spiritualist Association was founded on the 30th May 1931. The inspiration for this movement was the mediumship of Winifred Moyes, and the knowledge that came through from her spirit guide named 'Zodiac'. He claimed to be a teacher at the temple in Jerusalem during the time of Jesus. Each week her flat would be filled to capacity as she would give an address from Zodiac, which would then be reproduced and distributed to interested parties who could not attend. In 1936 there were 86,000 members worldwide. The most renowned medium in America during the late 19th and early 20th centuries. She consulted Dr. J. R. Cocke, a blind professional clairvoyant who was attracting considerable attention by his medical diagnoses and cures. At one of her first meetings with Cocke, Piper went into a trance and did some automatic writing. She handed her message to Judge Frost of Cambridge, Massachusetts, who determined that the message was from his dead son. Piper's career as a medium went into high gear, and her fame rose considerably when the mother-in-law of William James (psychologist, philosopher and physician) came for a reading. This was shortly after James's son had died, so he sat with Mrs. Piper and the evidence that James received convinced him of her powers to contact the departed. For the next eighteen months James controlled all the séance arrangements, and in 1890 wrote, "Taking everything that I know of Mrs. Piper into account, the result is to make me feel as absolutely certain as I am of any personal fact in the world that she knows things in her trances that she cannot possibly have heard in her waking state." For more than twenty-five years Mrs. Piper was investigated by many of the keenest men of science in the U.S. and England. She was famous for her séances, which typically involved her going into a trance and channelling a spirit by voice or writing. She found supporters not only in William James (1842-1910), but in Richard Hodgson (1855-1905), Sir Oliver Lodge (1851-1940) and Dr. James Hyslop (1854-1920). Born in Kensington, London, she was regarded as one of the most versatile mediums of her day. Although as a child she encountered spirits, Estelle did not start her development as a medium until she was in her thirties, using her clairvoyance and clairaudience to serve churches in South London and Surrey. She first became aware of her spirit guide 'Red Cloud' when she attended Hampton Hill Spiritualist Church. Estelle later conducted many séances and demonstrated many different forms of mediumship, including physical materialization and direct voice. She was so popular that she even demonstrated to a packed house at the Royal Albert Hall. In the 1950s Estelle was greatly instrumental in the legal recognition of Spiritualism by the British Government by conducting a convincing demonstration of mediumship for the House of Commons. A psychic medium who prior worked as a Glasgow barber, and is often known and presents himself as 'The Psychic Barber'. Gordon's career as a medium began at the age of 24, when he was told that one day he would be on the platform. This was the start of a 15-year study to develop his skills. Gordon is considered at present to be Britain's most accurate medium, renowned for his ability to pinpoint not only addresses, street names and places, but also the exact names of people. He gives demonstrations, wrote a psychic column for the British tabloid, The People, and is the author of several bestselling books on mediumship including The Unbelievable Truth. Born Doris Sutton in Grantham, Lincolnshire. She was recognized as a medium by the Spiritualists National Union in 1949, however in 1962 she gave up mediumship to become a nurse. Five years later Doris returned to her work as a clairaudient medium and later became a resident medium at the Spiritualist Association of Great Britain in London. She came into the public eye by appearing on Australian television which sparked sell-out performances at the Sydney Opera House. Doris became a worldwide celebrity touring many countries including America. She died after an operation to remove a brain tumor from which she never regained consciousness. Xavier was a famous Brazilian medium, often appearing on television. He produced his first automatic writings in grade school, where he claimed that an essay was given to him by a spirit. He went on to amass an enormous number of automatic writing scripts in various scientific and literary disciplines and is one of the world's most prolific automatic writers. Their mediumship involved slate writing and spirit typewriting (produced in a portable cabinet), but they are best known for their spirit portraits and paintings. At the turn of the century when Spiritualism was at its height and much publicized the Campbell Brothers produced physical phenomenon known as 'spirit paintings'. These were portraits and other works of art, done in various media that were produced under a variety of conditions. They lived at Lily Dale, but travelled widely, reportedly making twenty-two trips to Europe. Some of their work can still be seen at the Lily Dale Museum and in the Maplewood Hotel (as is the picture of Mr. Lincoln) in Lily Dale, New York. A physical medium born in the East End of London. As a child she claimed to hear the voices of angels. Her initial result with mediumship was at the age of 15, whilst experimenting with table tipping she levitated off the ground. Encouraged by her mother, Florence began to develop her gift and started sitting regularly in circle, and became proficient in other phenomena including automatic writing. She began giving public demonstrations of her mediumship as well as private séances. She would be overshadowed by a spirit called 'Katie King', who was alleged to be the daughter of Henry Morgan, the famous buccaneer. Later in 1872, Florence began attempting the materialization of Katie King with some success. It was Sir William Crookes, who eventually witnessed and recorded the full materialization, which proved to him that Florence's materialization mediumship was genuine. American magicians in the late 19th century, and the sons of a Buffalo, New York policeman. The Davenports began in 1854, less than a decade after Spiritualism began in America. After stories of the Fox sisters, the Davenports started reporting similar occurrences. The Davenports' most famous effect was the cabinet illusion. 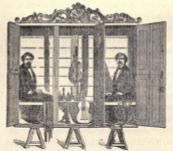 The brothers were tied inside a cabinet which contained musical instruments. Once inside it was closed the instruments would begin to play. Upon opening the cabinet the brothers were tied in the positions in which they had begun the demonstration. As news spread of their abilities the brothers embarked upon a tour around the world with their cabinet to demonstrate their mediumship. Many tests were carried out to establish the cause of the phenomenon most notably by professors from Harvard University in 1857. Despite various elaborate methods of restraints no scientific explanation could be found. The Davenports continued to demonstrate their physical mediumship in America, Europe and Australia. Despite suffering some hostility and persecution from the skeptics of their day, they are still considered by spiritualists the greatest mediums of their kind. Born Victoria Helen MacFarlane in Callander, Perthshire. Helen was famous for her physical phenomenon whilst in trance, including her ability to produce ectoplasmic materialized spirits. She was also famous for being one of the last mediums to be convicted under the The Witchcraft Act of 1735. In 1941 during one of her Portsmouth demonstrations Helen made contact with a sailor in the spirit world who was a crew member of the HMS Barham, a British battleship which had been sunk days earlier in the Mediterranean. Since all news of the sinking of the Barham was suppressed by the War Office, it was information which proved to be sensitive enough for Helen to become a risk to national security. Helen continued to work as a materialization medium until January 1944, when she was arrested and subsequently jailed five months before the D-Day Landings. It is widely believed that Helen was convicted in order to ensure that she did not bring to light any further sensitive military information. After being released in 1945, Helen continued her work and was arrested again in 1956, during a police raid of a séance in Nottingham. Sadly, she died from injuries allegedly sustained from being interrupted in a trance state by the police. Helen Duncan will always be remembered as the medium who directly influenced Parliament's repeal of the Witchcraft Act, which was replaced by the Fraudulent Mediums Act in 1951. Born in London, Edwards became interested in mediumship and healing in 1936 after attending an open circle. Harry was encouraged by other mediums to become a healer and was asked to give spiritual healing to a person suffering with tuberculosis, who later made a complete recovery. This encouraged him to continue with his healing work which quickly took over from his day job as a printer. As Harry's popularity and reputation grew, he found himself working at public demonstrations attended by as many as 6000 people. Ten years before his passing he established the Harry Edwards Healing Sanctuary in Shere, Surrey to carry on his spiritual healing legacy. Born in Hackney, Flint was one of the best known direct voice mediums. Leslie's sessions were captured on audio tape and saved for posterity. Many of the direct voice recordings were from spirits who were famous when they lived on Earth, and can still be heard on Leslie's website. In order to bring forward spirits for direct voice Leslie would sit in a dark room where the visiting spirits would form an ectoplasmic voice box outside of his body. The voice box would vibrate in a similar fashion to physical vocal chords and produce an audible voice. While he did retain some influence over this process as the medium the voices were for the most part independent. The most important documented and scrutinized physical mediumship seances of recent times took place between 1993 and 1998, known as 'The Scole Experiment'. The experimental sessions were held at the home of Robin and Sandra Foy at Street Farmhouse in the village of Scole in Norfolk. This sixteenth century farm house had a cellar which was a perfect venue for the experiments. Sessions generally lasted two-two and a half hours depending on the experiments being conducted. By pioneering new forms of tangible paranormal phenomena the aim was to prove conclusively, that death does not occur and that there is a higher dimension of existence hidden from normal perception by the limitations of the five human senses and current scientific instruments. The five-year experiment produced tangible objects from the spirit world including visible manifestations, lights, sounds, touches, tastes, smells, and messages transmitted onto photographic film, audio-tape and videotape. A team of spirit communicators made themselves known to the group, which consisted of 'thousands of minds' working in unison towards achieving tangible proof of the existence of an afterlife. The Scole Group allowed scientific scrutiny of their work, and the experiments were conducted in the presence of the researchers, David Fontana, Arthur Ellison and Montague Keen. The Scole Experiment suggests that solid scientific proof of survival may not be that distant with far-reaching implications. Daniel Douglas Home was a famous Scottish physical medium, often referred to as D.D. Home. Perhaps the most influential physical medium, who produced some of the most vibrant spirit manifestations. There are many stories about Home seeing spirits as a child including a recently deceased friend. He saw his mother in a vision who told him the exact time of her death. He became famous for talking to spirits along with his skill for moving objects around the room including levitating himself. On one occasion he is said to have levitated out of a bedroom window seventy feet above street level and back in again through the living room window. Home was unusual in that he had such diversity of mediumship as a clairvoyant, trance speaker, direct voice medium and a physical medium. It is considered rare for a medium to have such an array of developed talents. He travelled across the world demonstrating his mediumship for influential people such as Queen Sophia of the Netherlands and Napoleon III, all were impressed with his mediumistic skills. Home survived attempts by scientists such as William Crookes to prove that he was a fraud. He polarized Victorian opinion, some regarded him as genuine, while others thought him to be utterly contemptible. Throughout most of his life Home had suffered from tuberculosis, which took him at the age of 53. Born in Donington near Lincoln, and educated at Bedford School, University College School, London and Exeter College, Oxford. Moses was ordained as a priest of the Church of England by Bishop Samuel Wilberforce in 1870. He was regarded as the man who gave Spiritualism its Bible, and was one of the most remarkable mediums of the last century. Moses attended his first séance with Lottie Fowler in 1872. Charles Williams and Daniel Douglas Home were the next mediums he visited. Five months after his introduction to Spiritualism, he claimed to have experienced levitation. During his séances psychic lights would appear, he levitated, scents were present, musical sounds, the materialization of luminous hands and pillars of light. Moses also produced a great number of automatic writings, including his most well known scripts, Spirit Teachings (1883) regarded as one of Spiritualism's greatest classics and Spirit Identity (1879). These books offered clear evidence of the spirits high purpose with twenty-two spirit communicators, headed by one who signed himself 'Imperator'. The world-renowned British psychic artist had given fifty-four years of dedicated service and worked tirelessly to promote the wonderful message of survival of the soul after physical death. Coral stated, "My drawing hand was taken over by automatic control to ensure that the spirit drawing would be accurate." I will never forget the demonstration that I saw in the 80s at the Spiritualist Association of Great Britain when Coral drew a young lad. The next thing I heard was a scream from a woman at the back who said, "That's my Johnny and he was killed in a car crash when he was 10 years old." A complication which occurred on occasion with the pictures was the spirit would present himself or herself in a more youthful image than they appeared during their latter years of their life. This may be because they wished to assure their loved ones that they are well and happy. Coral also wondered if there could be a bit of vanity. Whatever the reason this could cause the relative or friend some difficulty recognizing the picture of the spirit person. Coral worked in nearly every country of the world, and was often interviewed on television, radio and in the press. She dried the eyes of countless thousands of bereaved people and it is fitting that she is remembered and paid tribute for she has earned her place as the twentieth centuries most outstanding psychic artist. Magicians have a long history of exposing fraudulent methods of mediumship. Early debunkers included Chung Ling Soo, Henry Evans and Julien Proskauer; and later magicians to reveal fraud were Joseph Dunninger, Harry Houdini, Joseph Rinn and James Randy. I can remember during one of my visits to Lily Dale when browsing in the bookstore being attracted to a book on the history of Lily Dale. In it I spotted a picture of Houdini and his wife Bess during a visit, and the caption read, "When Houdini visited Lily Dale the mediums hid in their cottages until he left." In an Encyclopaedia Britannica article on Spiritualism it is noted that, "The exposure of widespread fraud within the spiritualist movement severely damaged its reputation and pushed it to the fringes of society." I personally have experienced evidence on several occasions that proved to me that mediumship is a genuine psychic phenomenon. By the same token I have no doubt that fraud has taken place, however, there are two extenuating circumstances concerning fraud that are not widely known. The first is mediumship in its Golden Age was a lucrative profession. The gentry were willing to pay handsomely for an evenings night out of entrainment and comforting usually for the wife. A medium may have been genuine at the beginning of their career, but later on when their powers waned because of commercializing their gift they resorted to trickery. The spirits withdrew there support who were producing the phenomena, and the medium tried to reproduce them to save their way of life that they had grown accustomed. The second is genuine mediums cannot always produce phenomenon and instead of saying to the audience or the sitter, "I am sorry, but I am not getting anything tonight." They would make wrong guesses or fish for information in an effort to save the day and their reputation. With the advent of video taping these awkward moments can be recorded and analyzed later for fraud. When fraud is apparent the researcher proclaims the medium to be a complete and total fake, which is actually not the whole truth. I have absolutely no doubt that mediumship is real contact with the departed. My article The Red Hair is an example of one of my evidential experiences. There will always be those people either in the scientific or religious communities who have a vested interest in the status quo. These people are the last to accept new understanding for it would undermine a lifetime of a particular belief system. In a free society people such as these who have authority cannot prevent others who are free-thinkers from accepting the idea that death is not the end of the human existence or consciousness. It is with the masses that the responsibility rests for bringing new truth to light for the betterment of humankind.